A rock finds a new home--for now. Episode: 66. Site Numbers: 072, 330, 359, 362. Date Posted: 4 September 1998. Location: New Hampshire and Maine, USA. Type: Places. Episodes 39 and 45 dealt with the grave of Admiral Byrd at Arlington National Cemetery (072). The second of these Episodes noted that some errors in the marker's inscription would be rectified by a new memorial although a Byrd family member wrote me to suggest that plans had "fell through." I went on to ponder "...whether such a memorial will ever materialize." Well, it may not, based on a recent piece in the Boston Globe. 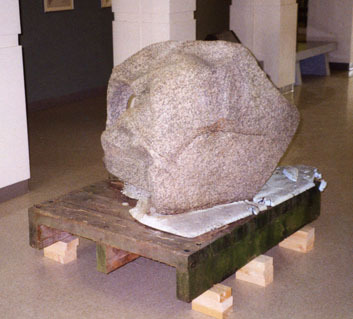 "Among the summer term arrivals to the University of Maine...is a half-ton granite boulder. "Winds of salt and sand from an Antarctic desert as dry as the Sahara sculpted the rock, carving a tunnel through one side and a deep depression into its top. According to professors at the university, it is possibly the largest stone from that continent in North America. "The boulder is on loan here thanks to a chain of friendships that links the university to Admiral Richard E. Byrd.... It was his eldest daughter, E. Bolling Byrd Clarke, who loaned the rock to the university, which is known for its scientific expeditions to Antarctica. "The rock was supposed to have been placed on Admiral Byrd's grave (he died in 1957) at Arlington Cemetery in Virginia. Instead, it has languished in a shed at the cemetery for about seven years, gathering a greenish mold from the damp. While Clarke still views this sculptural stone as a fitting tribute to a man who planned some of the earliest expeditions to the South Pole, her sisters were not so sure. "Speaking from her home in Pennsylvania, Clarke declined to comment on the reasons for her siblings' second thoughts, saying only, 'there's a difference of opinion as to whether or not it should be used; until we decide, we're loaning it to the university.'" Well, think I, why not make a several hundred mile round trip to Orono, Maine, to have a look at this rock? I set out not in the most direct way because I figure I might as well have a look at two other 'Low-Latitude' sites along the way. As it turns out neither proves significant in any real sense but you can't always predict these things. The first is in North Conway, New Hampshire. 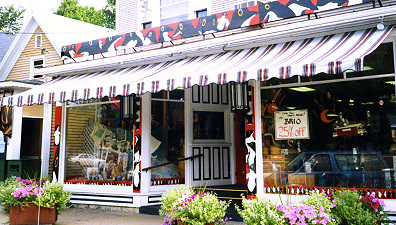 Friends had told me I should know about The Penguin Gallery (359) so I stop at it, on Main Street across from the town common. It's nothing more than a gift shop really in a town that's been touristfied beyond recognition. Despite the name, the penguin presence is limited to some T-shirts, coffee mugs, posters, and a few books. Although high on the wall is a shelf with a collection ("not for sale") of perhaps 50 penguins of various sorts in various forms. On north to Story Land (362) in Glen, New Hampshire http://www.storylandnh.com, which is alive with thousands of vacationing parents and kids out for a day of fun. Jack Mahany, the marketing man, is kind enough to slip me in free because all I'm interested in is the Polar Coaster. 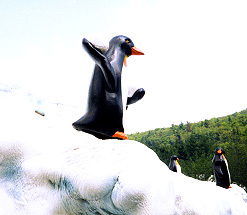 The Antarctic connection here is pretty tenuous but this miniature roller coaster sports a few penguins cavorting on the Styrofoam glaciers. A quick photo or two and I'm off again through the northwoods to Orono, Maine. Perhaps 15 minutes before the doors close I arrive at the Edward T. Bryand Global Sciences Building at the University of Maine. And there in the ground floor lobby area is the Byrd rock (330). It does look like a temporary loan--no label or sign, it sits somewhat askew atop a wood pallet. The place is empty; I think what a great Antarctic souvenir! But then I remember it weighs half a ton and so I head back to the car and turn towards home, 300 miles away.